Bumpus Jones was the talk of the baseball world at 22, a pitcher whose major-league debut foretold more potential than any other twirler who’d come before him. He was a big-league bust before he turned 24. But for one day on the cusp of two eras, Jones was the best there was in the game. He began — and for all practical purposes, ended — his major-league career by pitching a no-hitter for the Cincinnati Reds against the Pittsburgh Pirates on October 15, 1892. It was the final day of the season, making it the last time (other than that year’s Boston-Cleveland post-season series) that pitchers would throw with their back foot positioned 55 feet 6 inches from the plate. The distance was pushed back to 60 feet 6 inches the next season. Cincinnati had signed Jones off the local sandlots a few days before. “This makes his feat against the hard-hitting Pittsburghs at this season of the year the more remarkable,” Sporting Life said in its October 22, 1892, edition. Jones had grown up in Cedarville, about 65 miles from Cincinnati in southwest Ohio. A local semipro pitching phenom who went off to play pro ball in the Illinois-Iowa (Two Eyed) League, he became a sort of known commodity in the region. He spent most of the 1892 season pitching spectacularly for the Joliet Convicts, posting a 24–3 record before the team folded in early August. He signed with the Atlanta Crackers of the Southern League, making his debut on September 1, but the arrangement lasted less than a month because the Atlanta team folded on September 20. So Jones was idling back home in Ohio when a local semipro club, the Wilmington Clintons, tapped him to play for them in an exhibition game against the visiting Reds on October 12. Jones started in the outfield, but with the Reds winning easily, he came in to pitch the final three innings and shut them out. Reds manager/first baseman Charlie Comiskey was so impressed that he hired Jones to pitch his team’s National League season finale against Pittsburgh, and Jones made history. It was the second game of a two-game set for the two evenly matched teams. Cincinnati would finish the year at 82–68–5, and the Pirates would finish 80–73–2, although they won the season series with the Reds, nine games to five. 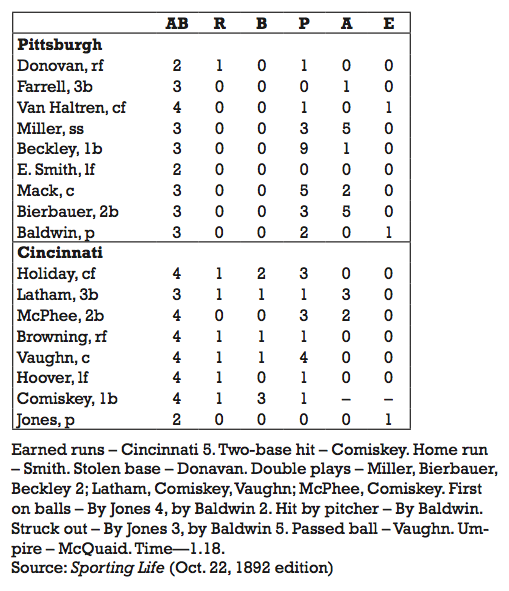 The Reds took the first game, 8–6, on Thursday, October 13. On Saturday, instead of seeing one of their veteran pitching stars, occasionally ambidextrous wonders Elton Chamberlain and Tony Mullane, take the box, Cincinnati fans watched the jittery Jones face a veteran Pittsburgh club that featured players like Jake Beckley, Patsy Donovan, and Connie Mack. Fortunately for Jones, he had a good defensive club backing him up. He walked the first two batters he faced, Donovan and Duke Farrell, but escaped trouble on an unusual double play. Arlie Latham fielded George Van Haltren’s bunt and threw to first for one out, then Comiskey fired home to catcher Farmer Vaughn, who tagged out the ambitious Donovan trying to score from second. Jones got another swashbuckling defensive boost in the second after walking Elmer Smith. Second baseman Bid McPhee made a fine running catch in shallow right field near foul territory, then threw to Comiskey to double up Smith, who was running on the play. The Reds took a 1–0 lead in the bottom of the second when Comiskey doubled, driving in Vaughn, who had reached on a throwing error by Pittsburgh pitcher Mark Baldwin. Pittsburgh tied it in the third when Donovan walked ( Jones’s final free pass of the afternoon), stole second, and hustled home when Jones slipped trying to field Farrell’s soft tap, then made a bad throw to Comiskey. Farrell was the last batter who would reach base for the Pirates that day. Jones retired the last 19 batters he faced, deceiving Pittsburgh’s batters with a motion that had him doubling his body into a knot before each offering. Meanwhile, the Reds pulled away with two runs in the fifth on Germany Smith’s home run, and added four more in the eighth against the beleaguered Baldwin. Sure enough, Jones was never that good again at the major-league level. Maybe the change in the pitching distance threw him off. He posted a 1–4 record with an ERA of 10.19 for the Reds and Giants in 1893, and didn’t pitch in the majors again. Two other pitchers have thrown no-hitters recognized by Major League Baseball in their first major league start: Ted Breitenstein (who actually preceded Jones by a year) and Bobo Holloman (1953).1 But both had pulled relief duty earlier, which means Bumpus Jones is the only player in the long history of baseball to throw a no-hitter in his first major league game — so far. 1. George Nicol allowed no hits in his first game with St. Louis in 1890 and Red Ames did the same in 1903, but those games are not recognized as no-hitters by MLB because neither went the required nine innings.